PFM is a hybrid between full metal and all-ceramic crown. PFM is made up of both metal and porcelain. A metal alloy is used to create a thin coping that fits over the tooth and porcelain is then fused to this metal substructure to form normal shape of the crown and give it a white, natural-looking appearance. Next to all-ceramic crowns, porcelain-fused-to-metal crowns look most like normal teeth. However, sometimes the metal underlying the crown's porcelain can show through as a dark line, especially near gum line and even more if your gums recede. These crowns can be a good choice for front or back teeth. 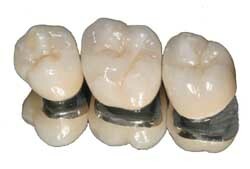 Porcelain-fused-to-metal crowns provide for a strong, durable and esthetic treatment option. One of the key factors for the esthetic and functional success of this type of crown is ensuring the preparation of the underlying tooth structure provides adequate space for the appropriate thickness of the material selected. Additionally, the artistic skill of the laboratory technologist creating the crown will determine its esthetic appeal.